A plaque commemorates Major Thomas Mitchell who with his expedition crossed the Murray here in October 1836. As at 17-February-2014 the plaque on this monument no longer exists. Major Mitchell and his party camped here on the 17th October 1836. 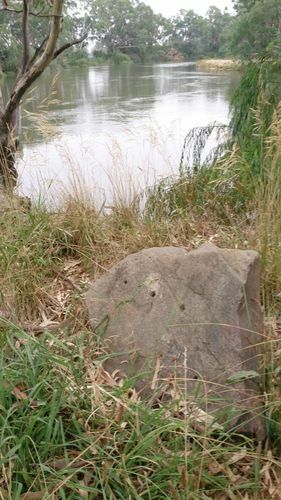 They crossed the Murray River the following day, downstream from this point. Major Thomas Mitchell's expedition into the 'Australia Felix' is commemorated by the Major Mitchell Trail , an Australian Bicentennial Project with assistance from the Commonwealth and Victorian Governments.